You've found the “U.S. Ayam Cemani Chicken Breeders” page here at Hobby Farm Wisdom! If this is the first time you have visited our site: Welcome! Ayam Cemani is a rare breed of chickens from Indonesia that has the distinct appearance of being entirely black. Due to excess pigmentation of the tissues from a dominate gene that causes fibromelanosis, these birds are completely black, including black plumage with a green shine, black legs, toe nails, beak and tongue, black comb and black meat, bones and organs. 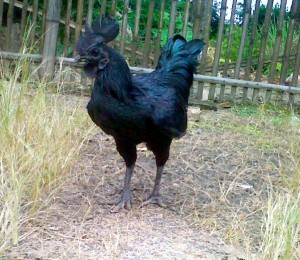 Contrary to some rumors, the blood of the Ayam Cemani is not blood, although it is surprisingly dark. Ayam Cemani chickens have been called the “Lamborghini of Chickens” and can cost $1,900 - $2,500 per hen. Their eggs are cream colored and unusually large compared with the size of the hen, although they are not good setters and hardly ever hatch their own brood.